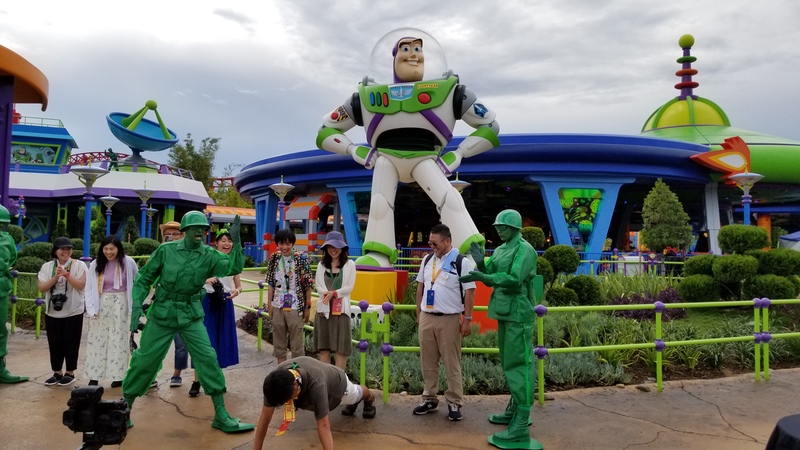 If you’re a toy, Disneyworld is even better – you have an entirely new and cozy Toy Story Land, based on the blockbuster “Toy Story” movies from PIXAR Animation, where you can join other toys in Andy’s backyard. Humans love Toy Story Land, which opened in Disney’s Hollywood Studios June 30, 2018. Visitors dwarfed by a nearly 20-foot-tall Woody enter an 11-acre backyard where other toys from the “Toy Story” films are at play and the Green Army Patrol (a gender-neutral name signifies there are women too!) is marching. Look for clues to the intricate theming that makes Disney attractions so immersive. Outside the popular Toy Story Mania ride, where guests can rack up points in a fun videogame style format, there’s a fully posable T-Rex Dinosaur on sale for $19.95, celebrating the year that “Toy Story” opened. Some benches are made of stained popsicle sticks. Visitors can look for a Lincoln Log cabin and at night, the whole place is illuminated the way a 9-year-old would, by hanging mismatched strings of Christmas lights. Red wax covered Babybel cheese rounds are part of the picnic tables in Woody’s Lunch Box, where school lunch fare has gotten an upgrade to include cocktails like “Grown Up Lemonade” with vodka. The bolder fast food menu includes a yummy, garlicy Three Grilled Cheese sandwich; the shareable Monte Cristo with layers of ham, turkey, jam and Dijon mustard; a purposefully healthy kids-size grilled cheese and smoked turkey; floats and fruit-filled pop-tarts. A new favorite: vegan Totchos, a chili with salsa served over tater tots. 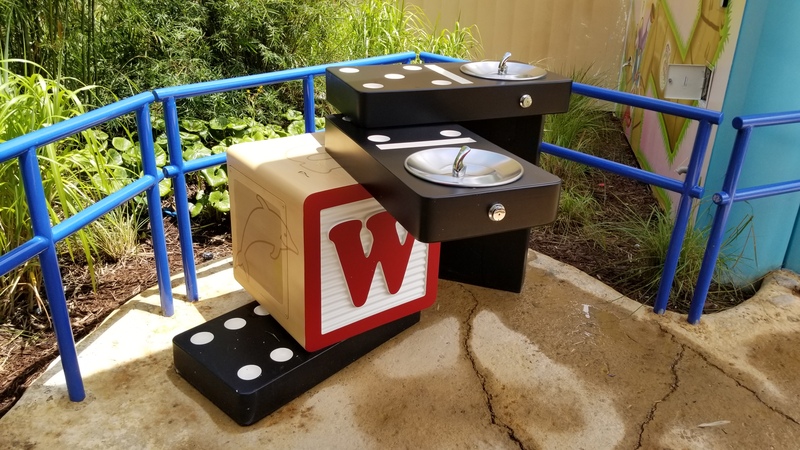 Wooden blocks and dominoes support water fountains in the new Toy Story Land at Walt Disney World. Be sure to use Fastpass to book the new rides. Slinky Dog Dash is based on the roller coaster that Andy built with a booster rocket and his metal coil Slinky, that mimics the humpback movement of a Slinky descending a staircase. It’s just the right amount of thrilling for grandparents and school-age kids. Toddlers and their parents will enjoy Alien Swirling Saucers, bumping cars towed by aliens from the Pizza Planet play set as they slowly spin 360 degrees. Newly refreshed PIXAR merchandise and unique-to-this-park toys are for sale from carts and in a big Beverly Sunset store. From visual evidence, we can confirm that Slinky Dog and Alien headbands work with every outfit. If you haven’t been to the Norway Pavilion since the blockbuster, “Frozen” opened, your family is in for a treat. Like all of Epcot’s international pavilions, it’s themed to Scandinavia but with a twist provided by Princesses Elsa and Anna. Have an album ready for your meet-and-greet with these sisters, then embark on an on-the-water journey through Arendelle in Frozen Ever After, the latest family attraction. In more PIXAR fun, The Seas with Nemo and Friends gentle ride has been refreshed technically for younger audiences and the aquarium accompanying it has some exciting specimens. EPCOT is also home to Turtle Talk with Crush, one of our favorite interactive shows. Teens will have fun in the America Gardens Theatre, where Star-Lord and Gamora from “Guardians of the Galaxy” join an alien band, playing music from their 80s mix tapes. Soon Epcot will get a new Guardians of the Galaxy attraction. A lot more PIXAR Animation entertainment is showcased in Magic Kingdom. At Tomorrowland, the Incredible Expo lasts all summer. Guests will encounter Mr. Incredible, Elastigirl, and Frozone from Disney•Pixar’s “The Incredibles” and upcoming “Incredibles 2.” Buzz Lightyear’s Space Ranger Spin is more popular than ever, and the Monsters Inc attraction – where you can text your jokes to Sully and he replies – is as fun as Turtle Talk. Don’t miss the other PIXAR characters who will appear in the daily parades and illuminations. Men and women of the Green Army Patrol march around Disney World trying to get guests in shape to serve. Last year saw the launch of Pandora, the world from the film “Avatar” which became an instant hit. There are stunningly scenic floating mountains, a new ride down the Na’vi River and a fantastic virtual reality ride aboard a flying banshee. For a non-PIXAR and totally classic cartoon experience, celebrate 20 years of Animal Kingdom at Dinoland U.S.A. as Donald Duck takes over. Can’t wait to see everything? It will be crowded, but there’s an offer promising 20% off Family Suites valid till September 29, 2018. Book it here and you’ll stay at the wonderful Art of Animation resort, a perfect entrée to the world of PIXAR. , where rates start as low as $117 per night. 2019 Alert! If you’re patient, you can save even more because the folks at Disney want to spread out visitors and reduce the crowds. That’s why they’ve come up with several value offers for 2019 vacations that we are sharing now. With so much going on, it’s time you planned a return to Orlando.